Active Ingredient (in Each Piece) - Purpose. Sennosides, Usp, 15mg - Stimulant Laxative. Inactive Ingredients: Cocoa, Confectioners' Sugar, Hydrogenated Palm Kernel Oil, Lecithin, Non-fat Dry Milk, Vanillin. Do Not Use Laxative Products When Abdominal Pain, Nausea Or Vomiting Are Present Unless Directed By A Doctor. Ask A Doctor Before Use If You Have Noticed A Sudden Change In Bowel Habits That Persists Over A Period Of 2 Weeks. Ask A Doctor Or Pharmacist Before Use If You Are Taking Any Other Drug. 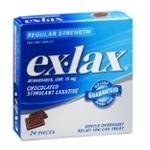 Laxatives May Affect How Other Drugs Work. Take This Product 2 Or More Hours Before Or After Other Drugs. When Using This Product Do Not Use For A Period Longer Than 1 Week. Stop Use And Ask A Doctor If Rectal Bleeding Or Failure To Have A Bowel Movement Occur After Use Of A Laxative. These May Be Signs Of A Serious Condition. If Pregnant Or Breast-feeding, Ask A Health Professional Before Use. Keep Out Of Reach Of Children. In Case Of Overdose, Get Medical Help Or Contact A Poison Control Center Right Away. Tamper Evident Feature: Do Not Buy If Clear Overwrap Printed With "ex-lax" Is Missing Or Torn.